• Comments Off on Favorite Tweets! How often was each Tweet favorited? Now you can tell, with a new column we’ve just added to our Twitter search tool – thanks to ScraperWiki user Alden Golab for suggesting this. You can sort by that column to find the most liked Tweet on a subject. For example, ScraperWiki’s right now is about our London Underground visualization. We don’t get large numbers of favourites or retweets on our account but the BBC Breaking news account has far more activity. We collected the tweets they made in the last week, including the number of retweets and favourites for each tweet. This amounted to 92 tweets, two of which were retweets of other accounts for which we did not get favourite or retweet accounts. We manually classified the topic of tweets for the biggest stories of the week. 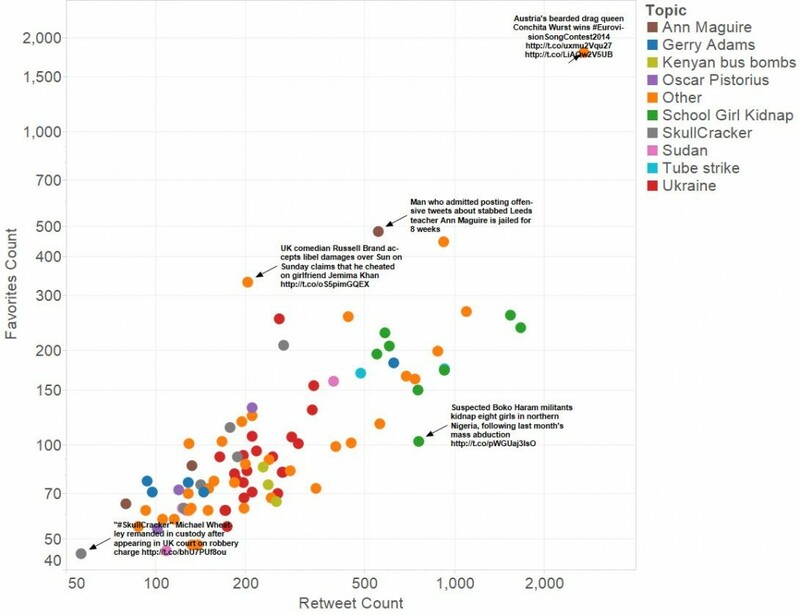 The chart below shows the tweets plotted by both numbers of Favourites and numbers of Retweets, a sample of the tweets are labelled with the text of the tweet. The points are coloured by the manually determined topics. The chart uses a log scale for both axes to spread out the individual tweets. In general the number of retweets and favourites increases together, tweets with more retweets have more favourites but this is only a loose relationship. In general people are more likely to retweet something than they are to Favourite it. No other strong patterns jump out, we suspect that the Twitter “Favourite” functionality is not wall named – it’s often used as a reminder to read something later. Pyschologically, there is probably an issue with “Favouriting” the report of a murder or some other atrocity. You can see more detail of this analysis in this Tableau Public visualisation.